The story of the Trojan War is amongst the most famous of the surviving stories of Greek mythology. There are of course many side stories around the Achaean siege of Troy, with of course the abduction of Helen, wife of Menelaus, being one of the most important. The figure of a 1000 ships is one garnered from the “Catalogue of Ships” as written down by Homer in book II of the Iliad. The Greek writer would write down 29 ethnic groups, 190 places and 46 named captains, and an actual figure of 1186 ships. There is debate as to how many actual men this totals; if each ship comprised the 120 men talked of in the Boeotian force, then a total of 142,320 men would have been amassed, but the ships of Meliboeans under Philoctetes comprised just 50 men, so a lower estimate might be as low as 100,000 men. Similar lists are to be found in other ancient sources, although names and number differ from Homer’s figures; in the Bibliotheca (Pseudo-Apollodorus) totals of 1013 ships, 43 captains and 30 groups of people, and in Fabulae (Hyginus) a figure of 1154 ships is ascertained. Thersander, Peneleus, Leitus, Arcesilaus, Clonius and Prothoenor. Their men came from Hyria, rocky Aulis, Schoenus, Scolus, mountainous Eteonus, Thespeia, Graia, spacious Mycalassus, men holding Harma, Eilesium, Erythrae; men holding Eleon, Hyle, Peteon, Ocalea, the well-built fortress Medeon, Copae, Eutresis, Thisbe, city full of doves; men from Coronea, grassy Haliartus; men from Plataea, Glisas, those who held fortified Lower Thebe and sacred Onchestus, with Poseidon’s splendid grove; men from Arne, land rich in grapes, Midea, sacred Nisa, and distant Anthedon. Men from Cyparissus, rocky Pytho, holy Crisa, Daulis, and Panopeus; men from Anemorea and Hyampolis; from around the sacred River Cephisus, from Lilaea, beside Cephisus’ springs. Locrians came from Cynus, Opous, Calliarus, Bessa, Scarphe, lovely Aegeiae, Tarphe, Thronion, and from around the River Boagrius. 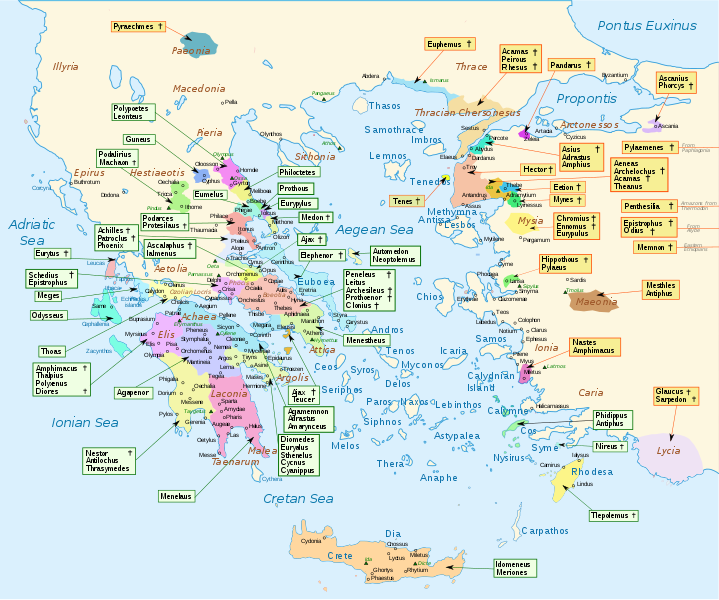 The Abantes, soldiers from Euboea, Chalcis, Eretria, wine-rich Histiaea, Cerinthus by the sea, men from the steep fortress Dium, Carystus, and Styra. Soldiers came from that well-built fortress Athens. From Salamis Ajax commanded twelve ships. Warriors from Argos, fortified Tiryns, Hermione, Asine, both with deep bays, Troezene, Eionae, vine-rich Epidaurus, Achaean youth from Aegina, Mases. …the Cephallenians, soldiers from Ithaca, well wooded Neritum, Crocylea, rugged Aegilips, from Zacynthus, Samos, both those inhabiting the mainland and those from cities on the facing shore. …the Aetolians, men from Pleuron, Olenus, Pylene,coastal Chalchis, and rocky Calydon. …the Cretans from Cnossus, fortified Gortyn, Lyctus, Miletus, chalky Lycastus, Phaestus, Rhytium, both populous towns, with other warriors from Crete’s one hundred cities. Nireus brought three well-balanced ships from Syme.